When we are single, we tend to treasure what we earn through our hard work. Then we work on our love life and we fall in love. Whether we have a negative net worth, a $100-million net worth, or something in between, many of us are willing to share what we have earned with our significant other. But there are some of us who wish to protect ourselves when we have much more than our significant other. These are usually where prenuptial agreements (called “prenups”) come in. However, prenups have gained some reputation as being in some ways negative things for couples, like a prenup assumes a divorce and it’s a tool that keeps “rich” people‘s money and assets away from the poorer spouse when the divorce happens. The idea behind prenups is to have open communication between partners in a relationship. Prenups are not just for the “rich” in the present; they can be for those who plan to be “rich” in the future, even as a partnership. A prenup does not have to protect what each person brings into the marriage, but can also set the roadmap for going together for the future. Prenups only matter in the event of a divorce. As mentioned before, prenups are about honest and open communication about finances. But these agreements are not in some way only useful in the case of a divorce. When it comes to the couple’s future estate planning, a prenup can actually serve as a tool to plan out the estate in terms of how assets and future children would be handled when either one or both partners pass away. Prenups are so very un-romantic and pessimistic. One of the keys to great relationships is great communication. Building a prenup is a collaborative process between the partners, including financial issues. So in reality, having honest and open communication is romantic and intimate, and that applies to prenuptial agreement processes as well. This then means that a prenup process can be a romantic date that strengthens a relationship. 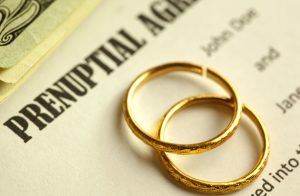 Prenuptial agreements can be useful for planning a marriage and an estate, and they are valuable exercises in communication and intimacy between partners. Prenups can be a productive process of collaboration, and can develop some security for the relationship. If you have a serious relationship that may lead to a long-term commitment or marriage, protect your relationship by getting a consultation from one of our attorneys who can walk you through the process of creating a prenuptial agreement.